McALLEN — A federal judge handed down an 18-month prison sentence to a local woman who admitted to lying on federal firearms records, court documents show. 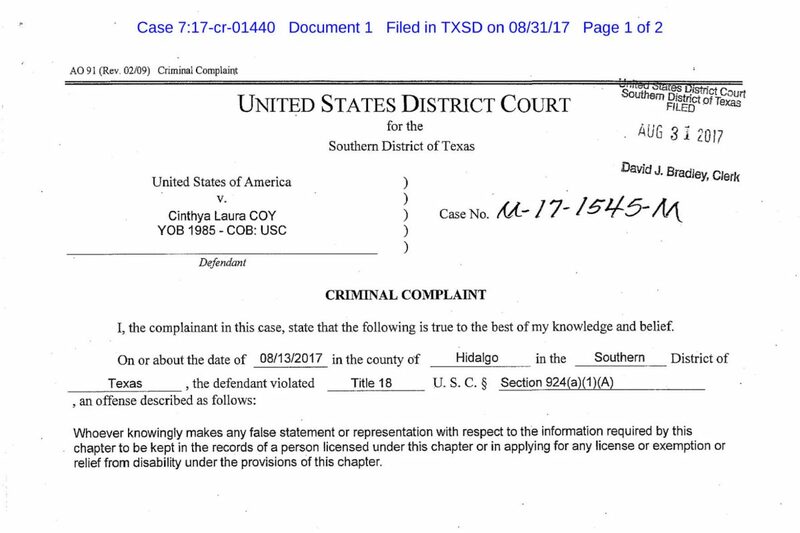 Government prosecutors said Cinthya Laura Coy lied on ATF Form 4473, the Bureau of Alcohol, Tobacco, Firearms and Explosives purchase of a firearm form, according to the complaint filed against her. The San Juan native filled out the form at a local federal firearm-licensed business to buy a Century Arms assault-type rifle Aug. 13, 2017, in which she stated she was the intended owner of the rifle, court records show. Prosecutors accused Coy of doing so intentionally and knowingly despite knowing she was purchasing the weapon for someone else. “Coy admitted she lied on the ATF Form 4473 when she indicated she was the actual purchaser of the aforementioned firearm, when in truth and in fact she purchased the firearm on behalf of another individ-ual,” the complaint states. The 34-year-old woman also said she had done so on at least six other occasions, but the complaint did not specify which types of weapons she had purchased. More than a week after Coy’s Aug. 13, 2017 purchase, ATF agents received information that the woman had purchased seven “highly trafficked” firearms in the span of 12 days, the record shows. Coy was arrested Aug. 30, 2017, moments after agents received word she was purchasing another firearm. “Agents followed Coy for several minutes before she parked at a local apartment complex in McAllen, Tex-as,” the complaint states. During an interview, Coy admitted she was recently paid and directed to buy multiple firearms for another unidentified individual. Coy, who pleaded guilty to the indictment against her Dec. 1, 2017, before U.S. District Judge Randy Crane, will also be placed on supervised release for three years upon completion of her prison term.